Here at South Bend Junk Removal service, we provide hot tub hauling service in South Bend, IN, for all sorts of major hot tub projects. When you're ready to remove your hot tub from your house, we're there to get the job done quickly. We are the leading junk removal company in the South Bend area, and we provide efficient and affordable hot tub removal and hot tub recycling. Here's why you should consider using a junk removal service instead of removing your hot tub yourself. Instead of spending your whole weekend attempting to figure out how to cut up a hot tub, we can be there and have your unwanted hot tub completely removed in just a few hours. Our experienced crew knows how to remove your junk in the blink of an eye with no rubbish left behind. We'll completely remove your hot tub and clean up after ourselves too, so you don't have to worry about a mess left behind. We have the equipment to handle large hot tubs. Even if you manage to remove your hot tub yourself, it'd be difficult to take it to the junkyard in a regular car. With our services, you don't have to worry about whether or not your hot tub is going to fit in your tiny sedan. We have the equipment necessary to get rid of your old tub efficiently, no matter what size it is. No job feels too big for us, so give us a call and see what we can do to help you get your space clean again. We've provided many custom services to clients over the years who needed large junk removal projects done. 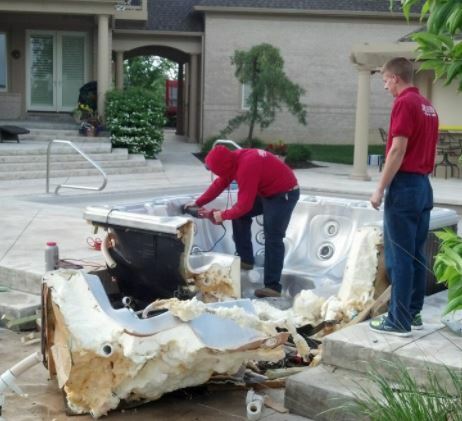 Here at South Bend Junk Removal, we offer the best hot tub removal prices in the area. We don't think you should have to pay a fortune just for someone to pick up your old hot tub, and we price our work appropriately to the task at hand. Call us today to learn more about our rates and even get a quote for your next junk removal job. We'll beat the competition and we're dedicated to providing you with the fair rates you deserve - we're the only provider of truly cheap hot tub removal in the area. You'll keep your backyard clean. Having an old, unused hot tub cluttering up your backyard takes away from space you could be using for something else. By using our hot tub removal services, you can keep your outdoor space clean and organized, and use it for something else you really want to install. If you've never used junk removal services, you'd be surprised at how helpful they can be. We're a one-stop shop for getting rid of all your old items you may have been hoarding for a long time. We help with all kinds of hot tub removal, as well as other forms of junk removal. Please contact us for all of your hot tub removal needs - we're here to help get your space clean and organized.